Need advice about a specific Toyota Corolla problem? Chart based on 62 repairs. 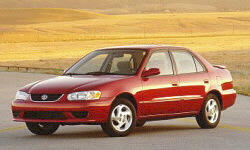 See TSBs and recalls for the 2002 Toyota Corolla. Chart based on 51 repair trips. The repair cost chart excludes repairs made under warranty, do-it-yourself repairs, and repair trips that include maintenance. See repairs for all Toyota Corolla model years. 110980 mi Engine threw a rod. Complete write-off. Oil changes regularly - last one five weeks prior to breakdown. No oil in engine at time of failure. No oil on driveway, no blue smoke, no low oil pressure warning light prior to rod being thrown. C $50 Replacement of pre-catalyser oxygen sensor. C $60 Rod Bearing Blown. Estimated $2500-$4500 for engine replacement. US $20 Muffler support bolt broke due to rust. US $469 1 of 2 exhaust gaskets replaced. 2nd not replaced due to stuck O2 sensor bolt. Timing chain tensioner O-ring replaced for leak Very slow leak at condenser o-ring, not repaired due to corrosion would require condenser replacement. Advised to recharge as needed every few years. US $460 Exhaust pipe at engine broke, due to both age and a minor muffler strike on a curb when backing into a parking space. Jan 2013 Compression low in cylinder 2. Rebuild required. No repair made. US $85 Oil Leak across engine compartment.Problem was determined to be bad PCV valve. Also completed oil change. US $115 Diagnostic charge ($85) for first DTC observed for the vehicle. Related to EVAP system malfunction - dealer quoted $360 for repair, repaired it myself for $30 for the part. Dealer indicated that part would not be covered under emissions warranty. 141000 mi Bottom part of the shielding that protects the catalytic converter had rusted and fallen off. Mechanic said that the upper part of the shielding was still in place and it would be fine as long as I didn't drive in tall grass. C $90 Front pipe exhaust noise, they had to replace front pipe gasket and bolts. Still making a little noise but acceptable. US $70 Windshield washer fluid reservoir deteriorated and replaced. US $15 Interior & Exterior Driver's side door handles failing because of cracking plastic. Repaired before complete failure. US $3 Yet another interior door opener broke. 107000 mi Possible mass oxygen sensor or catalytic convertor issues, engine drinking oil by the quart every 1000 miles. Opted not to repair. US $100 Wiper motor out entirely. checked fuses initially, then noticed burnt plastic on the cylinder joint where the motor is attached. Front passenger side inner door handle pull snapped clean off. C $550 Car not handling well. Replaced front struts. 151000 mi Air conditioner compressor started sporadically not coming on within this season. When it came on, it worked fine, but sometimes it didn't come on. The blower motor had problems throughout the life of the car. Six replaced under warranty over the years. The check engine light had been on for about two years. The repair shop said it needed a new catalytic converter. Really, I think all it needed was a new O2 sensor - it passes the emissions test with flying colors. 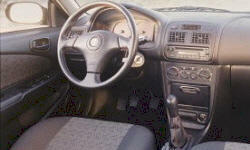 US $200 Replace leaking cam cover gasket Replace broken door handle. Replace sun damaged door panels. C $147 Timing chain tensioner was replaced as it was leaking oil. Had to replace front crankshaft oil seal as was leaking oil. US $700 failed charcoal issue. US $10 Clean fuel injectors - a Seafom bottle did the trick. It was turning on the Engine Light with code P172 - Mix to lean. US $15 Engine light came on; it was lean gas mix. I pour a bottle of sea foam drive it a couple miles and gone. It might need to clean the injectors. The same as before; I am believing the problem is relate to a particular gas station. Check engine light came on; gas mix too lean; added a Seafoam bottle, drove a couple miles issue resolved. See our lemon odds and nada odds page to see vehicles with no repairs or vehicles with more than three repairs. To see how frequently 2002 Toyota Corolla problems occur, check out our car reliability stats.